Well it has been a while so I think it is time to give away a book. 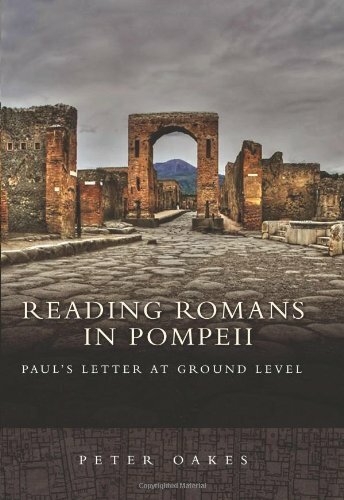 And since it was announced this week that an early fragment of Paul's letter to the Romans was discovered, I thought I would give away a book on Romans. This week's giveaway is Peter Oake's Reading Romans in Pompeii: Paul's Letter at Ground Level (Fortress, 2009). Here is the blurb. Peter Oakes relies on demographic information and data from excavations in nearby Pompeii to paint a compelling portrait of daily life in a typical insula, or apartment complex, like the ones in which Paul s audience in Rome likely lived. Imaginatively fleshing out profiles of the circumstances of actual residents of Pompeii, Oakes then uses these profiles to invite the reader into a new way to hear Paul's letter to the Romans as the apostle s contemporaries might have heard it. The result of this ground-breaking study is a fuller, richer appreciation of Paul's most important letter. If you are interested, put your name below and I will draw a winner on Sunday. The winner has 5 days to claim the book once their name has been posted. Unclaimed prizes go back on the shelf for another day. How do you feel about the participation of previous winners? ;-). Peter Oakes is a great guy. Oo - me! Nijay Gupta wants this book! Wow, looks like a cool book! I'm in!